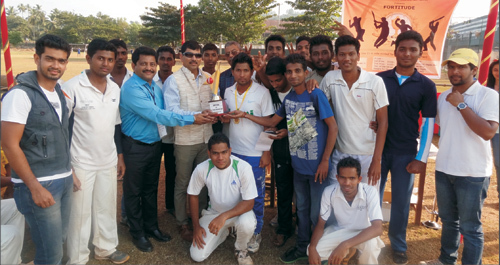 PANJIM: Government College, Quepem grounded MES College, Zuarinagar by four wickets in the final of all-Goa inter-collegiate tennis ball cricket tournament, organized by Vidya Vikas Mandal’s GR Kare College of Law, Margao, at Margao. Overall, sixteen colleges participated in the tournament. In the final, MES set only a 42 run target for Govt College Quepem, who restricted their opponents with excellent fielding and chased the target with Prasad scoring 16 runs, Shubham scoring 14 runs, Amar 12, which helped their college to win the final by four wickets. Prasad of Govt College of Quepem was adjudged Man-of-the-match and Ajay Kumar of MES College bagged Man-of-the-tournament. In the first semi final, MES College defeated Govt. College of Pharmacy by nine wickets. Batting first, Pharmacy College managed a meagre 25 runs in allotted six over. Their reliable batsman Mitesh and Raghu lost their wickets against tight bowling from Shubham, who took three crucial wickets. Chasing a scanty total, MES College won the match by nine wickets with Ajay scoring 24 not out and defeating Pharmacy College single-handed. In the second semi-final, Govt College Quepem restricted Dhempe College for 49 runs Govt college Quepem chased the required runs by losing only five wickets. The main run getters for Quepem College was Shivam and Sanesh who remain unbeaten on 14 and 12 respectively. Manager of PJN stadium Gurudas Vernekar inaugurated the tournament in presence of assistant stadium manager, Bhise. Disha Naik compered. Akshay Hegde welcomed the dignitaries. Sports secretary Krishnakant Hegde Desai proposed the vote of thanks.